This is my most recent version of a Giant Binocular Telescope. It is made of twin 13″ telescopes mounted at the center. It is not unlike the smaller hand-held binoculars familiar to you, with some significant differences. Development of this instrument has taken years of research and experimentation. Are these giants worth all the trouble? After all, won’t a binoviewer on a larger telescope do the same thing? And what’s the big deal about binocular vision? Is it really that much better? Read on! Many “telescope binoculars” have been built over the years going back apparently to Dolland and Alvan Clark (for more on this topic see Peter Abrahams’ Web Page on the History of the Telescope and Binocular ). After all, it’s an obvious idea. Take two large, identical telescopes and couple one to each eye. Dr. Henry Paul experimented with them in the 40′s. Lee Cain pushed the idea in the 80′s with a 13.1 inch binocular telescope on a Dobsonian (altaz) mount, then stretched it to seventeen inches. Dr. Robert Sudding maxed the aperture at the time I believe with twenty-inch class binoculars. These instruments are a pleasure to use when they are perfectly adjusted. Anyone who has had the experience of looking through a pair will tell you that. One problem, of course, is adjusting them. Collimation is a pain with a large fast Newtonian and becomes exponentially difficult when you have to match one to each eye (co-collimation) as well! The mechanical difficulties, especially flexure when aiming at different parts of the sky are severe. A slight amount of flexure in a standard Newtonian may not even be noticeable. But in binoculars it can be fatal. And adjusting the interpupillary distance is very tricky. Lee Cain’s solution to that problem was to make the top of the telescope (secondary cage) rotate. In principle, as long as the optical axis is perfectly aligned with the mechanical axis of the rotating assembly, this will work. This mechanical requirement is very stringent, as anyone who has tried to collimate binoculars knows from experience. My first lesson on that problem took place when I married the two 60mm telescopes to the front end of a pair of standard 7×50 binoculars with their objectives removed. And the problem has not been entirely cured in the giant binoculars I have seen. Often a little tweaking of the secondary is necessary when moving to a new object or when adjusting the interpupillary spacing for a different viewers. This, of course, means the optical collimation of the thus-adjusted telescope was no longer ideal, resulting in less than perfect images in one eye. These instruments are large, substantial and extremely well-crafted. So, I suspected that the problem required either massive steel and titanium construction or that it might succumb to a new and different approach. My experiments with large binoculars have taken place in an environment of severe financial constraint, to say the least. But a few years ago an irresistible opportunity presented itself. I owned a good 13.1-inch f/4.5 Dobsonian and an identical instrument became available at an attractive price. I had always dreamed of building a giant binocular telescope. And with that idea in mind, I bought the “twin” telescope! But what about the focal-length? It has been suggested that the focal-lengths of the objectives MUST BE IDENTICAL TO WITHIN A FEW WAVELENGTHS OF LIGHT. Could I be so lucky? Nope. The new telescope was a full inch longer in focal-length. But, is the focal-length really the important quantity? Actually the most significant factor is the magnification which must match very closely. I have read of binoculars made with objectives of differing focal lengths and correspondingly different focal length eyepieces. The only important constraint is that the magnification seen by both eyes must be nearly identical. Being too lazy to go dig up data on the stringency of this constraint, I decided to simply try it out. Besides, I thought I might be able to find some slightly mismatched eyepieces which would compensate by the two percent or so I needed. So I built an extremely crude, temporary structure to hold the mirrors and put the question to experimental test and see if my eyes could compensate for the mismatch in magnification. It looked pretty good. My eyes were able to compensate for the slight mismatch. Jack Eastman, an optician friend of mine, warns that I might get a grand headache from this instrument after twenty minutes of constant viewing. I have not spent that much steady time at the telescope yet, so we’ll have to see. But, at least for periods of up to several minutes, the ill effects are not forthcoming. 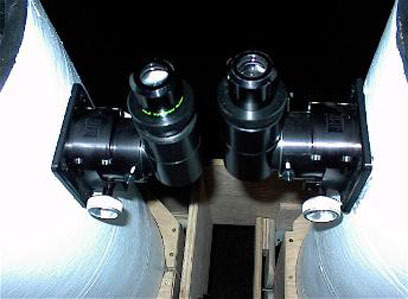 The eyepieces are twin 21mm Televue Plossls and are identical in focal length, at least within much less than the two percent needed. I know this because I have tried switching the eyepieces many times and never have noticed any variation. My first piece of advice to prospective binocular telescope builders is do not spend large sums of money paying your optician to fabricate twin objectives which are identical to within a few angstroms. It is not necessary. I’ll bet if they are within a few millimeters of the same focal-length, they’ll perform as well to the eye as “perfectly matched” optics. It would be fun to test my “horribly mismatched” optics against a pair of better ones, and see if the difference could be detected at the eyepiece. 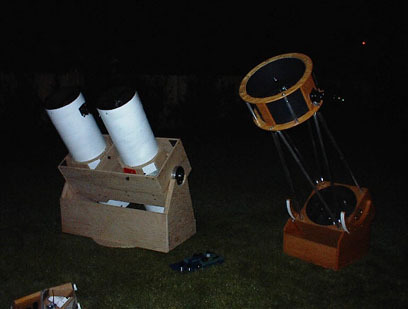 Amateur made twin Newtonian telescopes are becoming more popular. One problem in fabricating these is grinding two mirrors to the same focal length. I wrote the following text to answer a question about just how exact the match needed to be. The difference in field isn’t critical, but the difference in magnification between the two images is important. You can’t merge two images into a binocular view if one of them is slightly larger, and tolerances for this are very tight (and can’t be fixed by shifting the mirror in the tube). If one mirror is 64 inches and the other 63, using two 14mm eyepieces, you’d get 128x & 126x. There are standards for this, discussed on p740-1 of George Smith and David Atchison. The Eye and Visual Optical Instruments. Cambridge: C.U.P., 1997. 816p. One source says magnification differences of less than 0.75% are not clinically significant, between 1% and 3% symptoms appear, between 3% and 5% binocular vision begins to be impaired, and over 5% binocular vision is very poor or absent. US mil standards are 2%. Stereo resolution (perceiving distances) is linearly related to magnification differences. I think these tolerances are a bit loose for our applications. Consider binocular viewing of a globular cluster that fills a wide field eyepiece. If you change the magnification by 2% in the left eyepiece, will you be able to merge the images comfortably? Stars at the edge of the cluster would be moved out about 1/50 of the distance across the field. This could be the subject of an experiment with a barlow behind each eyepiece, sliding one barlow out of the tube by a tiny amount to vary magnification. Some people report significant differences between two ‘identical’ eyepieces; and there certainly are tolerances to how closely the marked focal length matches the true focal length. I have never had any problems with mismatched eyepieces, among the 20 or 30 pairs that I’ve tried, including pairs where one is made years after the other. But other people do have problems with this. Presumably there’s a large degree of individual variation in ‘sensitivity’. There are many requirements of any optical system: adjustability, reasonably sharp images, etc. Binoculars have a particularly stringent and obnoxious set of additional complications associated with matching two independent systems to the eyes of a single viewer. This makes them a challenge which many amateur telescope makers (rightly) find daunting! One of the most important requirements on my list was to build binoculars which could be co-collimated without affecting the collimation of each individual telescope. I thought I’d like a much more compact system as well, if I could have that in the bargain. Like all dedicated ATMs, I could write several chapters about my many failed experiments involving the use of tensioning wires, variable interpupillary spacing by focus compensation, etc. The result of several years of trial and error is pictured below. It did not look pretty, but it worked amazingly well! This is a pair of experimental 13″ binoculars. It (and its predecessors) served to test several ideas. Here are some of it’s features: You can see that the assembly folded up for nice compact storage and transport. It had a center mount (much like an inverted fork). This is not as stable as a traditional Dobsonian, but is adequate and MUCH MORE COMPACT. Compromise sometimes pays enormous rewards; in this case the reduction of perhaps a hundred pounds of weight and much faster setup than a Seurrier Truss. Of course, all (portable) binocular telescopes have to be collimated and then co-collimated (This is a HUGE PAIN!). 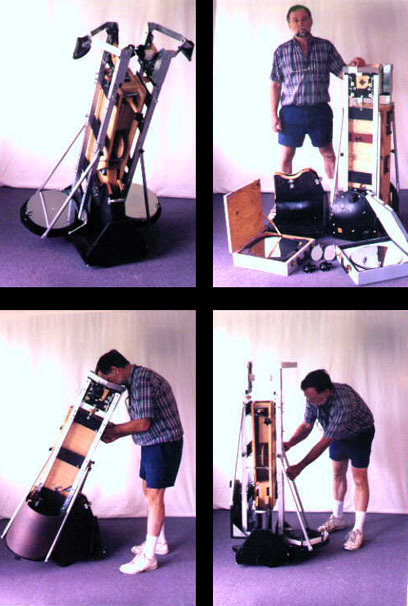 Large Dobsonians also must usually be assembled and adjusted on site. Depending on the particulars it could take ten to twenty minutes to set-up a large telescope. Large binoculars I have worked with take a correspondingly longer time to assemble and tweak into adjustment, even after some practice. Half an hour is perhaps a reasonable estimate. This 13.1″ was a bit better, taking about twenty minutes with luck. Assembly of this binocular was reasonably easy. The two hinged drop-wings were folded out in about 20 seconds after the “dagger bearing” was inserted into its slot on the base and tightened. Collimation of each individual telescope was fairly standard. Adjusting for field rotation was a simple matter of twisting the two star diagonals in their sockets. This arcane sounding process may be inconceivable to you if you have never done it, but will be no more mysterious to you than collimation of a Newtonian if you ever actually do it. Focus was achieved by moving the entire focuser, secondary mirror and tertiary star diagonal (prism) up and down on a fairly complicated set of bearings (this was much simplified in my “pretty version”). Surprisingly, this did not affect the collimation very much, and not at all if you don’t have to focus for other users. By far the most important and useful innovation in this design was the “co-collimate on the fly” philosophy. The co-collimation shifted slightly when the binocular was moved to a new location in the sky (because of structural flexure). This system flexed more than a large, well-constructed “Cainian” (after Lee Cain). But, relative flexure was PART OF THE DESIGN! I knew it would flex, no matter how well I could build it. So, like a sailboat, it was designed to flex and be adjusted to compensate. That’s the main reason it could be so compact! Operating this telescope was more like sailing than traditional observing. You set a course, then trimmed your “sky schooner” to match the gravitational “wind” and hold the tiller tight. Built into this mount was the ability to adjust the optical axis of the entire right telescope about two axes perpendicular to the optical axis. The right telescope was “hanging” on an adjustable “pseudo-azimuth” and hinged to adjust about the other axis perpendicular to the optical axis and the “pseudo-azimuth” – much like caster and camber on the front wheels of a car. The resulting motions were very similar to horizontal and vertical controls at the eyepiece. The interpupillary adjustment was quite similar to a standard pair of hand-held binoculars. 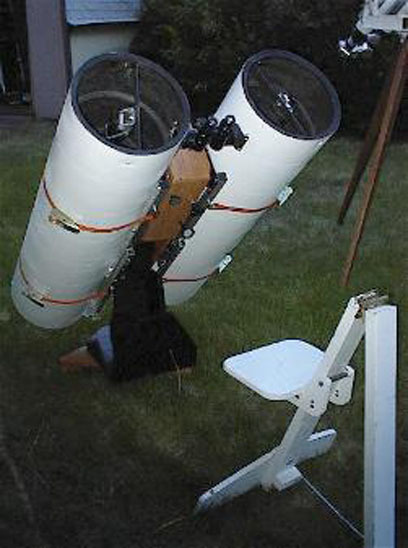 The left telescope was hung from two substantial hinges (offset slightly from the mechanical axis of the telescope mount and parallel to the optical axis of the telescope). There were knobs attached to push bolts operating against spring tensioners to affect all these motions. The resultant operation was simple and intuitive, believe it or not. Anyone could adjust the horizontal and vertical controls to their individual taste once they were shown the location of the controls and encouraged to use them. Focus and interpupillary adjustments were not much different than with any set of (individual focus) binoculars. The main effect was that the instrument was fairly easy to use. Point it somewhere, adjust the horizontal and vertical knobs a bit and enjoy. When I had several friends sharing the views it was easiest to use them with a low power so as to minimize time-consuming interpupillary and focus adjustments between observers. Most times, the horizontal and vertical adjustments did not need to be reset for each observer, though they needed fixing when you moved to a new target. The human eye is quite sensitive to vertical mis-collimation and relatively insensitive to the horizontal, so I usually adjusted the horizontal first (to avoid my eyes’ natural tendency to compensate which is automatic when the vertical adjustment is perfect), then tweaked the vertical into perfect alignment for strain-free observing. I didn’t usually mess with the field rotation except as a necessary part of the initial setup. Dale Keller has had the opportunity to use these binoculars. To see his comments go to Dale Keller’s page. He also has a nifty parallelogram binocular mount! The problems with this design were numerous. The setup time was long. The constant readjustment was a hassle. I decided to build a more robust system in an attempt to see if these problems could be ameliorated. The result is pictured next to my seventeen-inch. This version of the binoculars used the same 13.1′ optics but was more robust. The telescopes were still independently adjustable for co-collimation. The interpupillary adjustment was achieved by using the pictured crayford focusers (requiring individual eyepiece focussing, of course). Was the additional stability helpful? Yes, but at a cost. This binocular telescope was much steadier, as you might expect, but it still required minor adjustment every time the scope was aimed at a new target. And it required an enormous amount of labor to set up. After several years of experimenting with these things I found myself asking some a few pithy questions. Is all of this trouble worth it? Is a binocular telescope superior to a one-eye telescope of equivalent aperture? Can giant binoculars be made hassle-free? These are important questions to prospective builders of such giants. On a several nights over the last couple of years, I have taken my 17.5″ Dobsonian and my 13.1″ binoculars to a dark sky site. On the night of one memorable test session the seeing was very steady (unusual in Colorado) with much detail visible on Jupiter. All these optics are extremely good, with superior pedigrees and nearly perfect performance under careful testing. 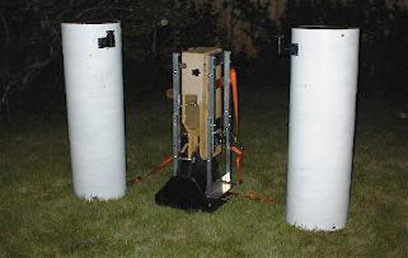 I tried both instruments on several targets, of various types. I made nearly all comparisons using approximately the same magnification through both (about 150x for most cases). The exit pupil was different in each instrument, of course, but fairly small so as to reduce effects due to the outer edge of the lens of my eye and make sure my 51 year-old eyes were accepting all the light. The effective light gathering of each instrument is about the same including the additional loss from the third reflection in the binoculars. On M13, both views were spectacular, with stars resolved to the core. My notes indicate more detail in the 17″ but the detail is more obvious in the binocs. The Veil Nebula was obvious in the 17″ and even MORE obvious in the binocs, with exquisite fine detailed knots and tendrils in both. Careful comparison indicated more detail visible in the 17″, but the detail was more “true” in the binocs. My notes here indicate that the effect in the binoculars was similar to the effect that many experienced deep sky observers are familiar with which occurs when you move the telescope slightly and faint nebulosity jumps out at you; the brain tunes in to motion. Apparently the brain tunes in to binocular vision in a similar fashion. Jupiter showed much banding, swirls and fine detail in the 17″. The effect in the binocs was DUMBFOUNDING! It looked as if the seeing had just been locked down to perfect! It seemed as if as much or more detail was visible in the binoculars and it was OBVIOUS! Perhaps some of this was the standard effect of smaller aperture on seeing effects. I noticed that when one eye was seeing a momentary blur, the other was seeing a clean view. Subjectively, the effect was astounding. I strongly suspect that an experienced planetary observer would be able to painstakingly extract more detail through the 17″ with many tens of minutes at the eyepiece. But, through the binoculars such information was immediate, intuitive and unquestionable. In the 17″ the dust lanes of M31 were easy. In the binoculars the dust lanes jumped out of the eyepiece and slapped me in the face! My overall impressions were that the brightness in both instruments was about equal. Faint object detection was easier in the binocs and detail was more obvious in them as well. Discriminating appraisal indicated more actual detail in the 17″. The planetary image in the binoculars was equal to the 17″ general, but the comparison is difficult to make because the differences were qualitative. There is something profoundly satisfying and comfortable about the views through the binoculars. This is something which must be experienced to be appreciated. The effects I noticed have been described by other binocular users. Lee Cain wrote an article in the December, 1986 issue of Sky and Telescope (pg. 662) which addressed this issue, in part. My experiments seem to support his comments there. I suggest you try to get a look through large binoculars some time, so you’ll know what we are talking about. After my night of careful comparison, which telescope did I prefer? The views through the binoculars were superior in some notable respects. But critical comparison showed that the actual image had more detail in the larger telescope. Nevertheless, there was a strong element of “Gee Whiz” with the binoculars. If I had to choose just one instrument for a particular evening I’d consider it this way: for a lazy night of relaxed viewing, or when time was at a premium, I’d take the 17″ Dobsonian. However, if I was prepared to endure more setup time and more twiddling with adjustments all the time, then I’d opt for the binoculars. Much has been made about the powerful advantage of binocular vision. Many experiments by others and my own personal experience have taught us that you can see a lot more if you are using two eyes. Your brain is designed that way. I wondered if my binocular telescope would be better or worse than using a binoviewer. So I conducted some experiments. This was very informal and mostly subjective but here are my observations. I compared the views through the 13.1″ binoculars with the views through a binocular viewer on the 17″ to see if the “Gee Whiz” aspect of the experience translated to binoviewers. I even went as far as redesigning the 17″ so that I would not have to use a barlow with the binocular viewer. This required shorter truss tubes and a larger secondary to provide the necessary backfocus. As a result I was comparing views at the same magnification (about 95x) with slightly different exit pupils (3.3mm on the 13″, 4.7mm on the 17.5″). I wanted the exit pupils to be relatively small to reduce any possible aberrations from the human eye’s fully opened pupil. I consider that the light loss differences were slight, since the 13″ suffers an additional, third reflection even though the 13″ has about a ten percent edge on overall aperture. On several occasions I made the comparison. I called this the “Popeye Challenge” since binocular views are often called “eye-popping”. So I asked fellow observers to take the “Popeye Challenge” and give me their impressions. Testing was done at a nice dark sky site. To a person, everybody agreed that the views through the binocular telescope were superior. However, it took a long time to get the binocular telescope perfectly adjusted for the beautiful, sweet views they could deliver. Even with the robust construction of this model, I still had to tweak it in every time. And every user had a different interpupillary separation, which, with this design required refocussing! Making these adjustments between observers was a pain! Every new target required more tweaking for each observer. Frankly, it detracted from the pleasure of the experience. After awhile, I came to prefer the convenience and ease of the Dobsonian. Even though the binocular viewer I was using was not very good and there was a LOT of light loss (I’d like to try a Televue binoviewer sometime) it was very nice. But it was not worth redesigning my 17″ to accommodate them. I have now returned my 17″ to it’s original, optimized design and use my binoviewer with a barlow. This seems to be the best solution to the problem. My advice: if you are rich, buy a really good binoviewer, like a Televue. But don’t reconfigure your scope to use it at low power. Use it with a barlow for viewing bright, small objects like the planets (this is lots of fun) and smaller deep sky objects. I do not consider the binoviewer to be extremely compatible with deep sky observing because of the huge light loss (at least in mine) and the requirement that they have to have a barlow (meaning high power only) with fast reflectors. These experiments led me to conclude that the hassle of inexpensive, large binocular telescopes made them a rather poor bargain for the average ATM, like me. While they were very fun and exciting, the difficulty of construction and use of these scopes made them fairly impractical. There were other ATM’s working in this field: Wayne Schmidt , Bruce Sayre, The Bolton Group (Gerald Bramall, Brian Webber and David Ratledge) and HERE. Also see Clive Milne , Steve Swayze and this fantastic site. The goal of simple, light-weight, giant binocular telesopes may have been reached by these builders. But, my large binocular telescopes became more complicated and ungainly every time I tried to fix a problem. And the escalation was exponential! Admittedly my building techniques were sometimes primitive, as is often the case with prototypes and experimental designs, especially when you are on a limited budget. Certainly the techniques required to build a well-engineered, sure-fire successful, light-weight binocular telescope like Bruce Sayer’s or Clive Milne’s seemed to be out of my reach. Over the years I had come to consider an interest in giant binoculars to be a kind of curse. I found myself thinking “If I just change this or that a bit it might cure all the problems… “, and I spent another 6 months on a new version… only to discover new problems and unsuspected ramifications of my changes. The process seemed to be unending. I realized this was the nature of research and one of the attractions: it is not simple. But periodically I became exhausted and had to back away for a while. It helped to have a small success with some other, easier project. Then I became reenergized. These giant binoculars had been my curse (dare I say obsession?) for many years. Unfortunately fellow ATM ‘s like the folks listed above had the power to start the juices flowing again. In early 2000, I recieved emails from Dwight Elvey, Bruce Sayre, Jim Lawrence, Clive Milne and others. It was very refreshing to hear from these people who had a good sense of the problems inherent in such telescopes. Their comments about adjusting for field rotation, interpupillary separation, etc. were congruent with my own experience. They told me about some of the things they have worked with and gave me some ideas for improvements. I owe these people a huge debt of gratitude for their advice… even when I didn’t take it, I always considered their wise comments very carefully. So, it was back to the drawing board with more ideas and back to the shop to improve my construction techniques. The late night curse of the ATM is to be constantly searching for the magic cure for the ailments of his instrument. I had the idea that the ideal solution would be to have a nice dark-sky site where I could build a massive steel binocular telescope permanently mounted in an observatory. Unfortunately, that was not a real possibility. And I was not completely convinced that my only recourse was the “brute force” approach. I thought I might go back once more to my original design. There were many incremental improvements that could be made in that design: better mirror cells, easier interpupillary adjustment and, most importantly, better mechanical stability. The other ATMs’ success with their scopes (which are designed along similar lines) lead me to believe it might be possible to get results close to theirs using my simple techniques. As you can see this is a hybrid of earlier versions with a few changes in some systems. The overall design is not basically different from the first one but many incremental improvements have been made. The larger-sized, full-length tubes improve the stability of the optical assemblies. The take-up screws for interpupillary adjustment and horizontal co-collimation control have been repositioned for greater mechanical advantage and the resulting improved stability. 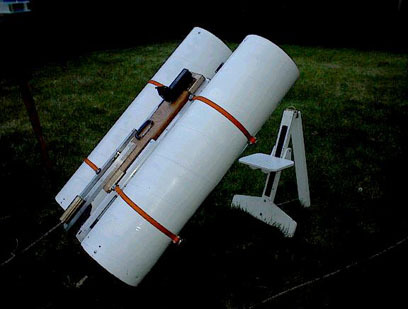 The individual telescope tubes are strapped on using inexpensive, ratcheting tie-downs. The center section has three convenient and simple adjustments for interpupillary separation, horizontal alignment and vertical alignment. The reinforced sonotubes are very rigid, especially under compression against the aluminum tubing. Even though they take up more space, the increased stability of full length tubes is quite important. The assembly on site is very quick; about 5 minutes. Collimation of each individual scope is about 5 minutes or less. And co-collimation is a SNAP! The center assembly is much more stable so co-collimation takes seconds! Each separate telescope holds it’s individual collimation pretty closely and registration marks on the tubes allow easy reassembly in nearly perfect adjustment. The center mounting system is not as mechanically rigid as an “outboard” mounting. But, it is stable enough so that shakiness is fairly modest. There is no effect on co-collimation due to this compromise and this configuration results in a MUCH less massive mount. The adjustments are convenient and easy to understand. Even a novice to the telescope quickly catches on to their function. There are three means of adjusting the interpupillary separation: the tubes can be rotated, the helical focussers can be adjusted (requiring refocussing) and the fine adjustment is made by “swinging” one of the tubes on a pair of hinges. The fine adjustment for interpupillary separation is convenient and easy since it does not require the subsequent refocussing of each eyepiece. This is the adjustment that is actually used in practice. The telescope tube has registration marks on it so that the tube angle can be re-established with ease. The telescope’s improved rigidity makes it less susceptible to mis-collimation as you move from place to place in the sky. As a result the adjustments after repositioning are very slight. Though the pivots for the horizontal and vertical adjustments are “low” and not placed near the eyepiece, the fact that the telescope is much more mechanically robust means that these adjustments are always very small. This is an acceptable compromise and allows the horizontal and vertical adjustment controls to be in easy reach for the user. This telescope fits in the back of my Honda Civic and I can get it set up and adjusted in about the same amount of time my truss-tube 17″ Dobsonian. The views through this telescope cannot quite be duplicated with a binoviewer on a telescope with the same effective aperture, even if you reconfigure the larger scope so you don’t have to use a barlow. I consider my binoviewer to be a wonderful addition to my viewing accessories. Todd Gross is quite right in his appraisal of their merits. But, it is impractical to make a binoviewer work at really low magnifications. As you go up in aperture, holding a constant focal ratio, the exit pupil increases. 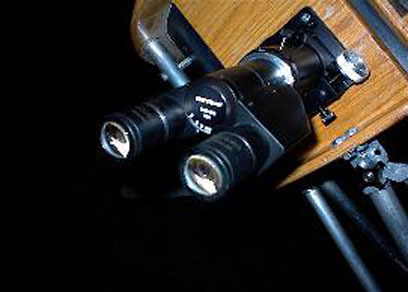 With a binocular telescope like this you can get a bigger exit pupil at a lower power with the same effective aperture as a larger aperture “cyclops” scope. This is a low power GIANT! If you ever get the chance to look through one of these large binocular telescopes you will see why they have so much appeal. If you are courageous or foolish enough to try to make one, good luck! Please let me know how it goes. Peter Abrahams’ Web Page on the History of the Telescope and Binocular, Wayne Schmidt , Bruce Sayre, The Bolton Group and HERE. Also see Clive Milne , Steve Swayze and this fantastic site.